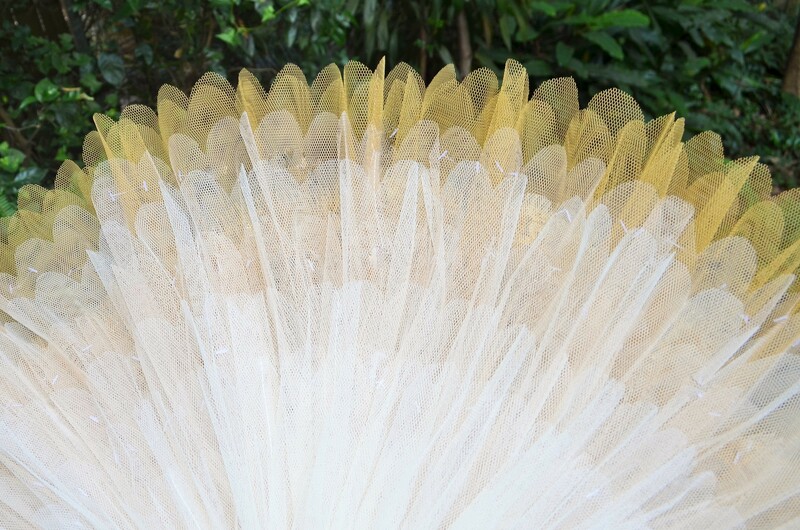 Ivory and gold are classic colours for an elegant and sophisticated tutu. 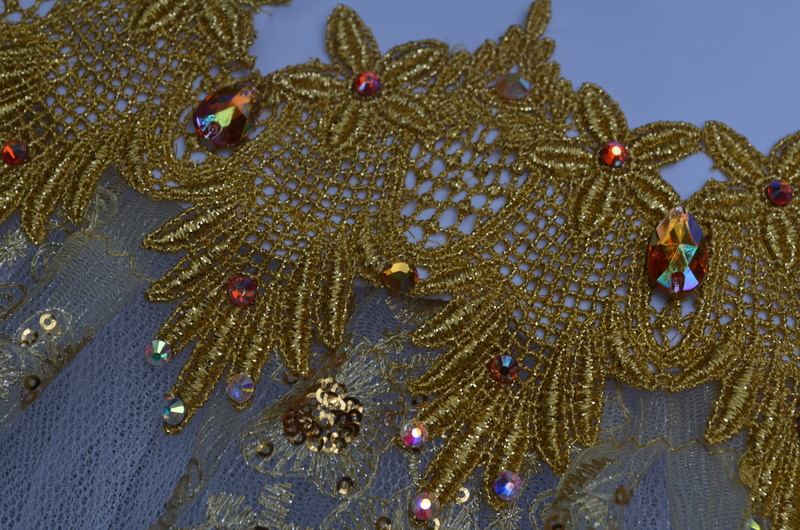 Here I’ve used gold venise lace with crystal AB, citrine and topaz rhinestones, and added pearls to lighten the effect of the heavier parts of the gold applique. 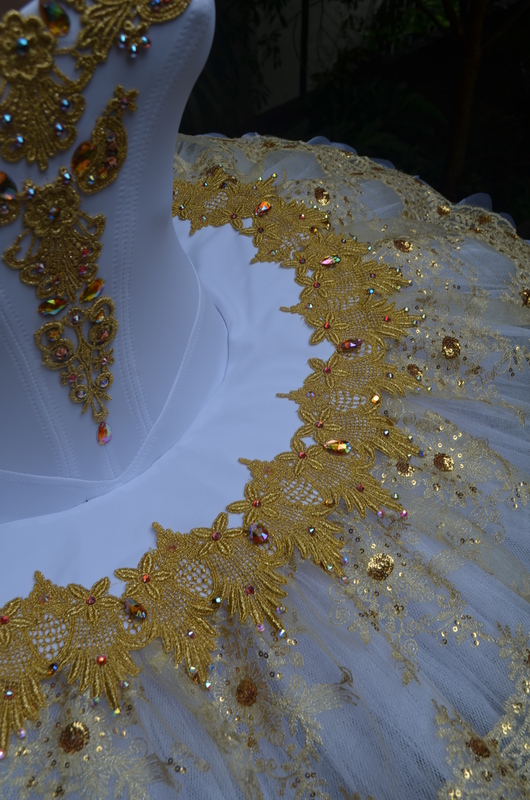 My client wanted the tutu to have rich embellishment without being too heavy so we decided on a small plate but added the trailing jewels on the skirt for a bit of added interest. You can see here the skirt isn’t just plain ivory but it has a layer of glitter tulle for subtle sparkle and under that a layer of champagne to give a little warmth to the skirt. I’m just about to leave for my holiday so I have a little bit of time up my sleeve to blog my last 2015 tutu . This one has quite a bit of detail so get ready to plough in. 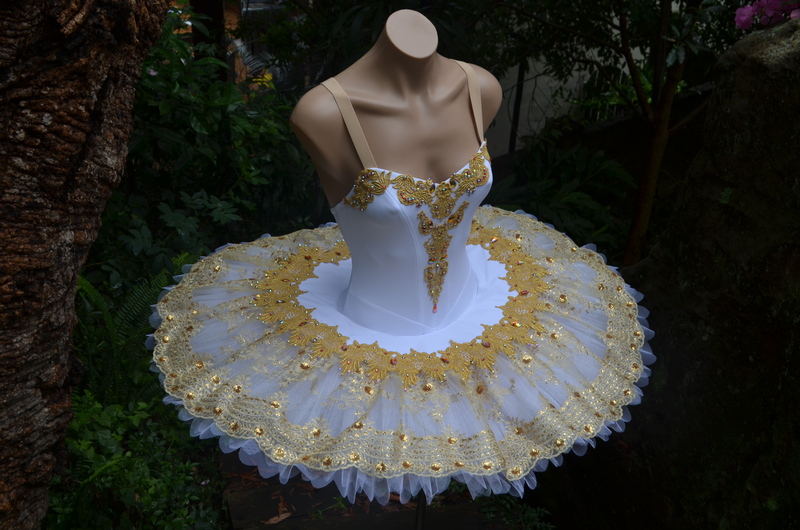 This is white and gold tutu for Paquita. The accents are a dark gold and red. 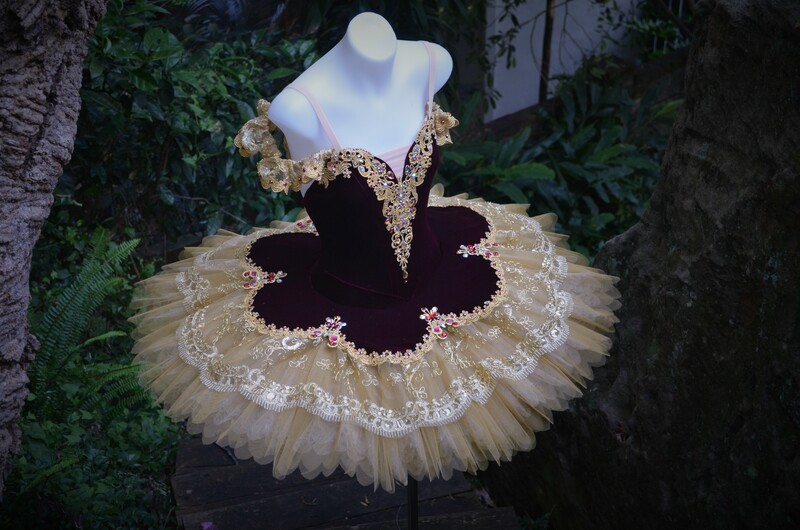 I build the tutu on a lycra leotard with a faux basque to resemble a classical tutu. I use Danielle Legge’s pattern which is available via her FB page or website. If you’re thinking of making your own tutu I’d urge you to use her pattern. It really is the best available. Next I constructed the plate. 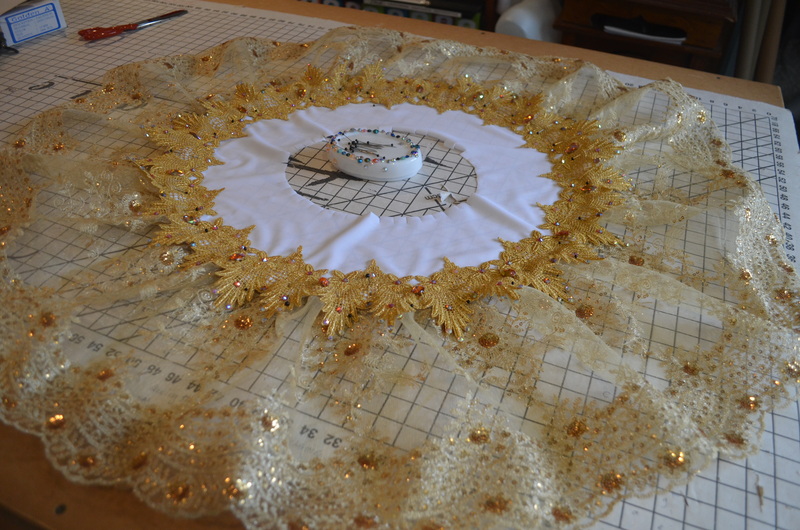 Here I have placed the venise lace on the lycra plate. 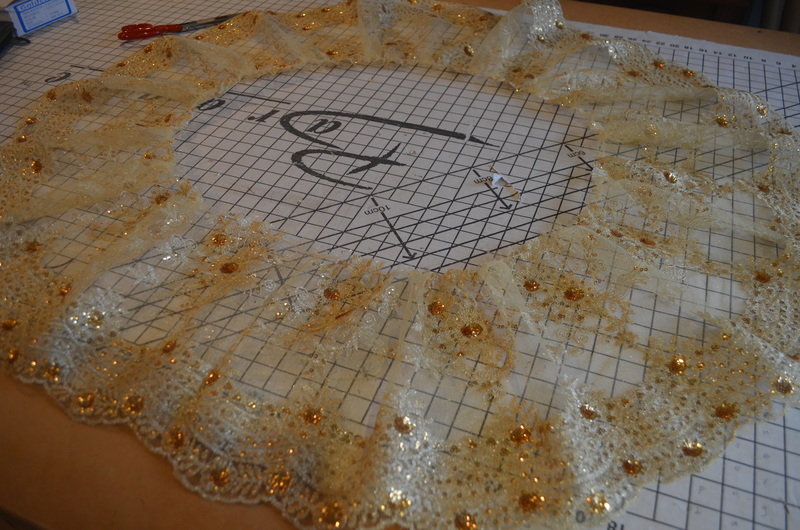 I sewed the lace to the plate with gold metallic thread. 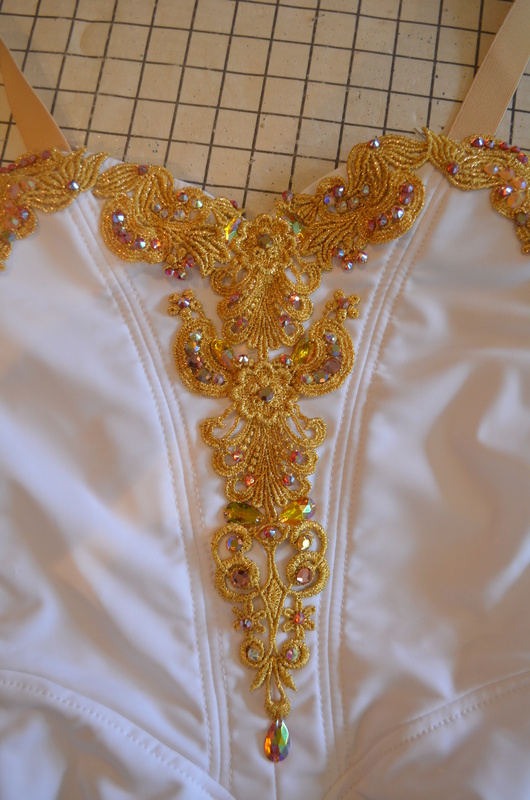 Once it was attached I glued on the rhinestones and then trimmed the lycra around the edges of the lace. The plate was about 1/3 the width of the skirt. The lace overskirt filled the remaining 2/3 of the skirt. 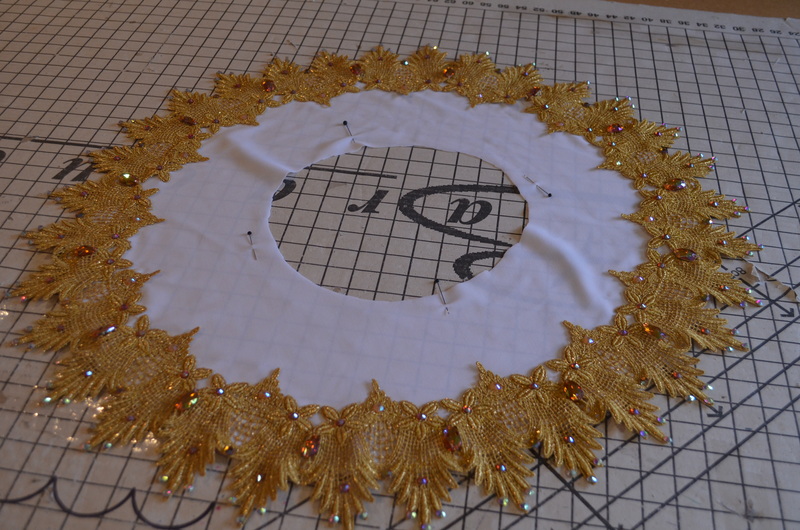 Here I have gathered the lace lightly to fit around the edge of the plate. This tutu had 8 layers of net. Each layer has between 3 and 5 widths of net. I cut them on a self-healing mat with a rotary cutter and a quilter’s ruler. It’s the easiest and most accurate way to cut 60 linear metres of net. 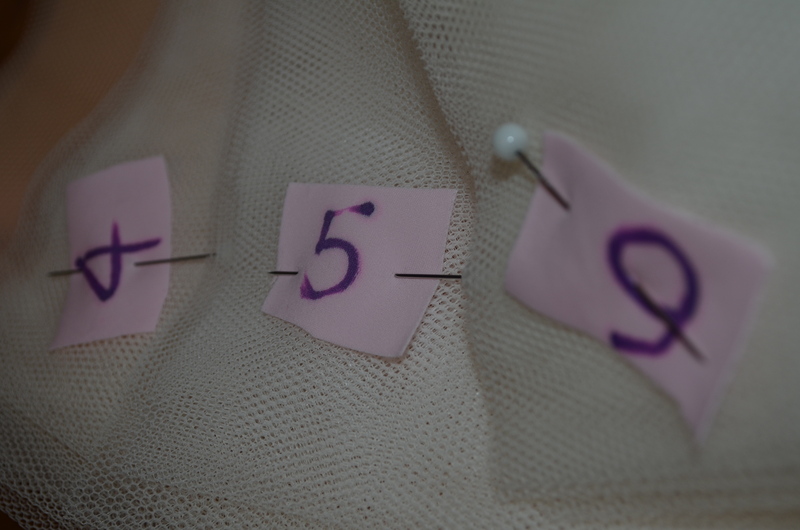 Each bundle is numbered as they are only about 2cm different in length and hard to distinguish at a glance. After the widths are cut I feather or scallop the edges if required by the client. For this one I scalloped the edges. 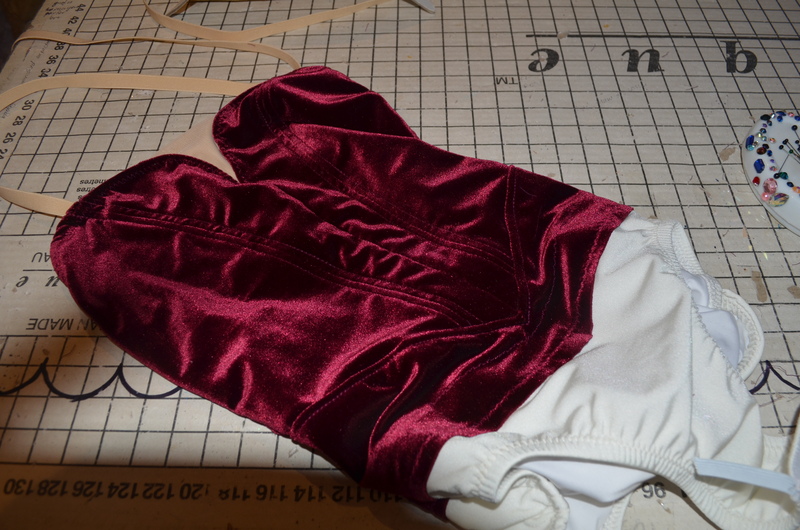 The widths are sewn together to make long lengths that are gathered and sewn onto the lower part of the leotard. I sewed the widths together from the outer edge matching the clipped edges. The overlap is about 1cm wide. When the widths are all sewn together I roll them up for ease of handling. When I gather them the roll unrolls from the top so that it doesn’t roll onto the floor. 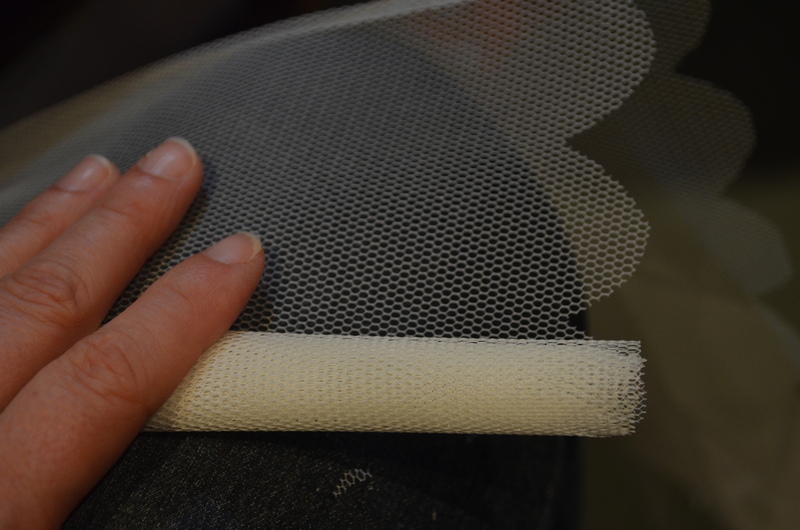 Because this tutu has lace right to the edge there is a possibility the net may droop after a few years due to the additional weight even though the net I use is very stiff. If the tutu does need a little bit of a pick up after a few years hooping can be inserted. This is much easier to do if the hoop casing is already inserted. I will do this for tutus with wide overskirts even if there is no immediate need for hooping. 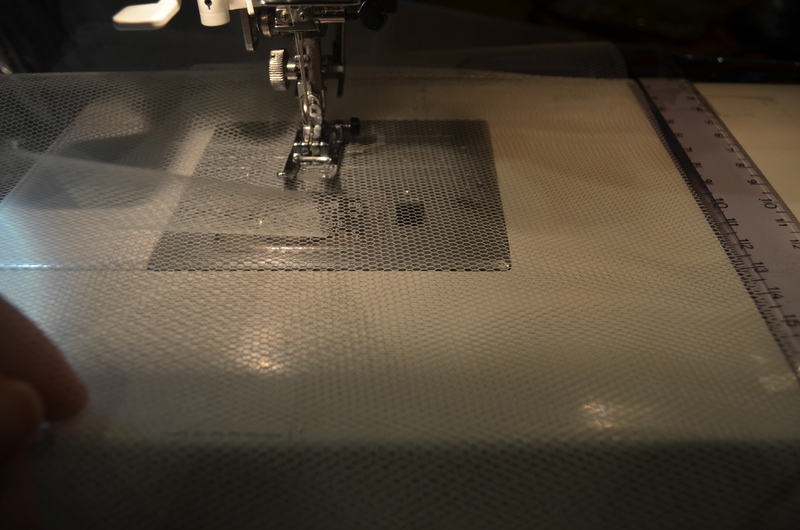 In this picture you can see a 5cm wide casing being sewn onto the middle of layer 4. The ruler and the edge 0f the pressure foot are the guides for placement. If hooping were to be inserted it would be done just before this layer is tacked. The hooping wire is covered in light fabric to match the skirt and pushed though the casing. Tacking starts at the bottom three layers. The remainder are held up out of the way with some wide elastic. The bottom three layers are tacked together. The next 2 layers are dropped down and tacked to the top layer of the first 3 that were tacked together. This is continued to through all the layers. The tutu is therefore constructed of groups of 3 layers of net tacked together which are internally attached to one another. 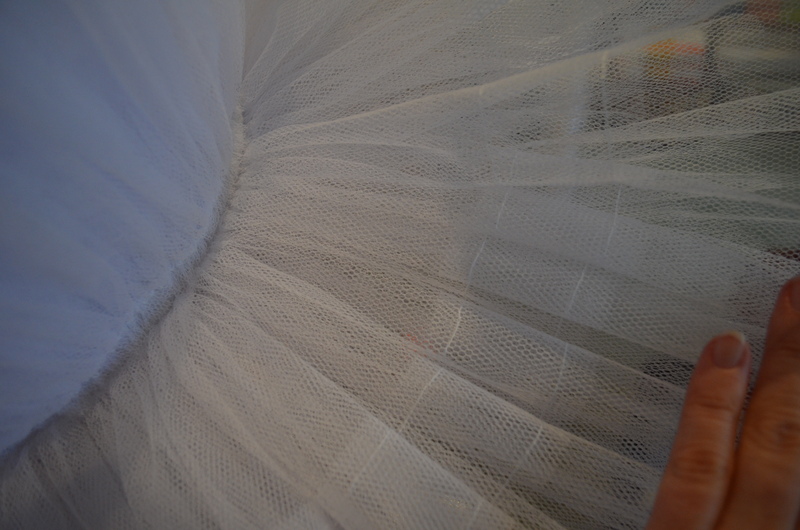 This allows the tutu to move softly but without the layers fluffing up. 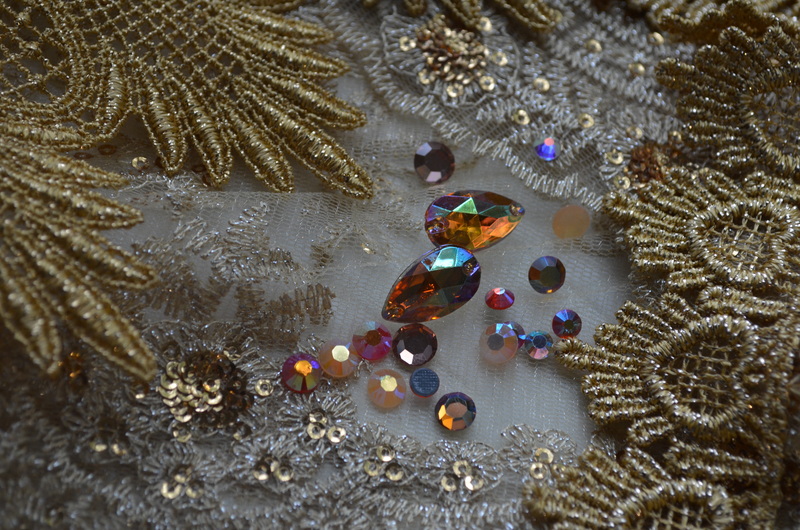 This photo shows the variation in the rhinestones I used. 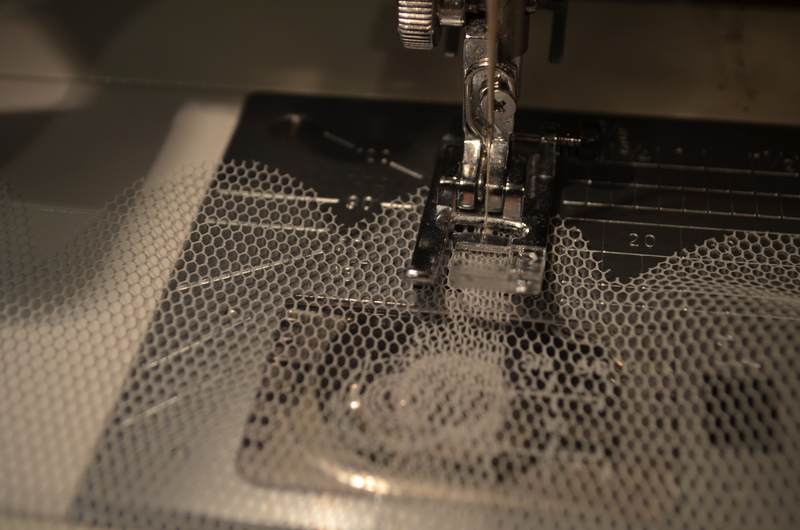 The plate was sewn as close to the bodice as possible through the top layer of net. 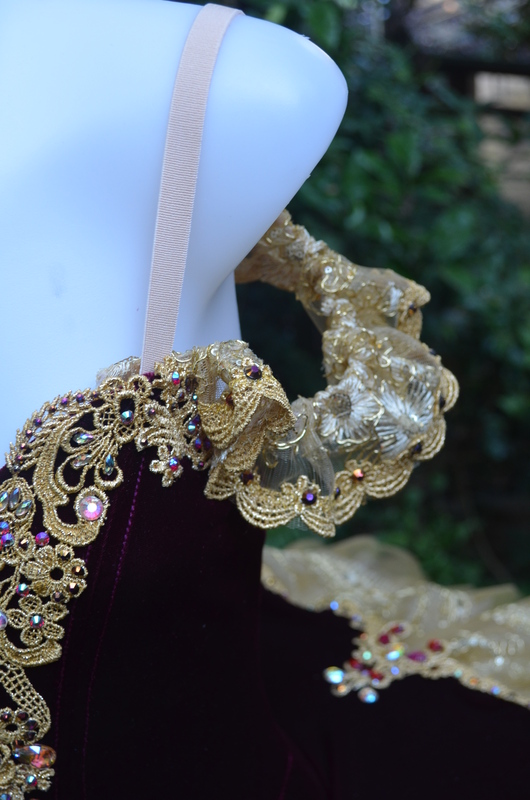 The very edge of the lace can either be sewn with gold metallic thread onto the top layer of net or tacked on using the same tags that are used to hold the tutu layers together. 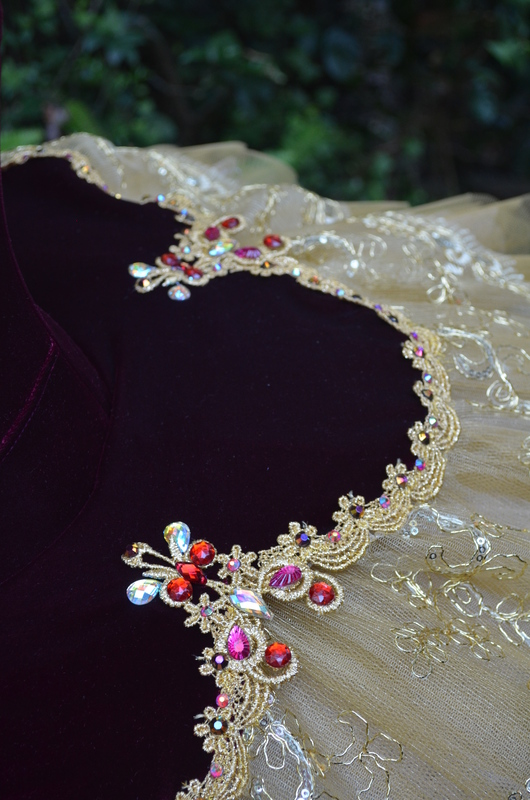 The red and dark gold rhinestones add a warmth to the decoration. 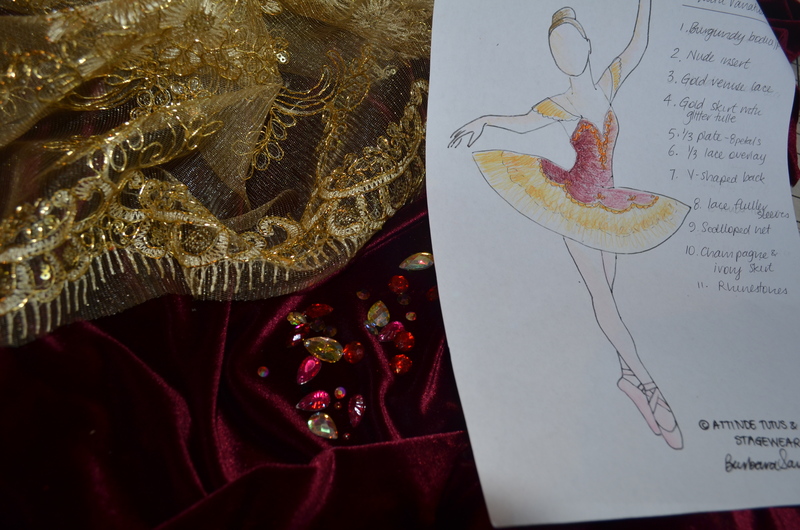 Burgundy and gold are a perfect match for Paquita. I teamed it with rhinestones, venise lace and corded lace and I included some warm gold net in the skirt. I decorated the leotard before I put the net on. I stretched the leotard onto body board and then sewed on the embellishments. 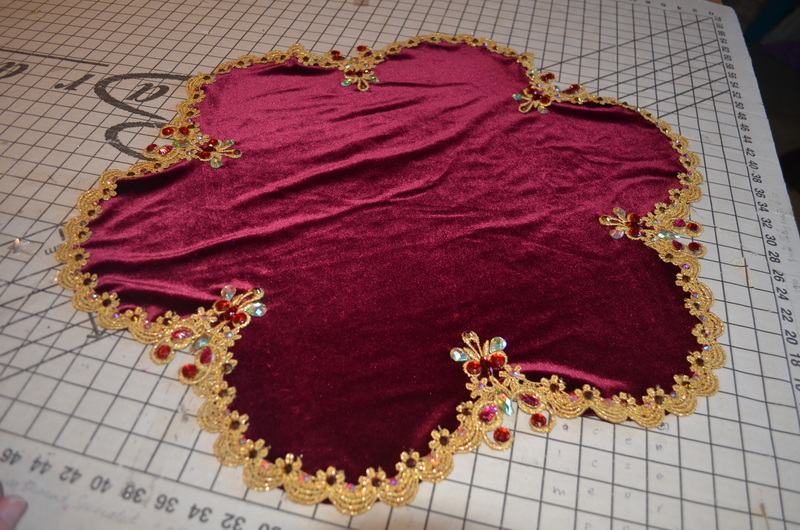 After finishing the bodice I prepared the plate. 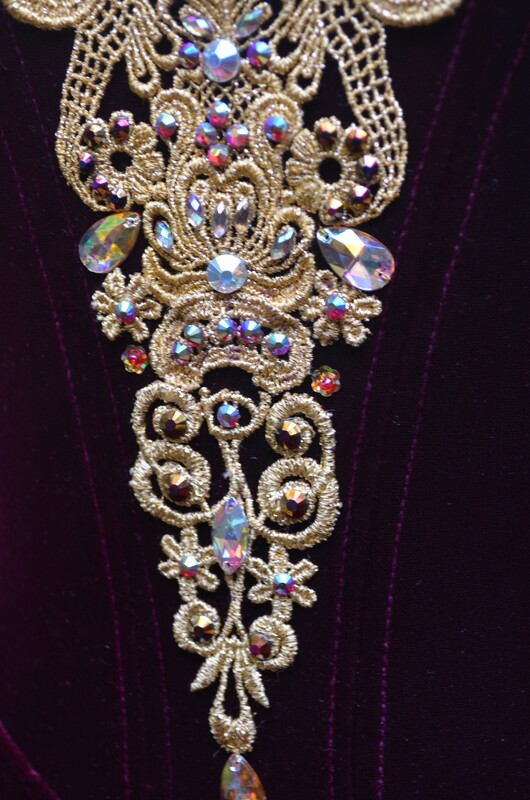 The trim is attached by machine with metallic gold thread. The centre hole is marked on the wrong side of the fabric and then cut out and clipped so it will fit snugly around the high hip. The skirt was made with2 layers of gold net on the top and alternating layers of champagne and ivory don to the ivory pants. The plate also has an overskirt of light corded lace. I used a combination of red, scarlet and fuchsia rhinestones. Small draped sleeves made from venise lace and corded lace completed the picture. The tutu was one of my favourites of the year and was sent to the US for YAGP.